Putin’s leading liberal opponent in the Russian presidential election campaign, Kseniya Sobchak, excluded in convincing terms even the remote possibility that Putin was behind the 2000 murder of her father and his mentor, the late pro-democracy Mayor of St. Petersburg Anatolii Sobchak — a version of his death favored in the West and among some Russian liberal and intelligentsia circles. The family claims Sobchak was murdered likely by hardliners in the Yeltsin administration. He died of a heart attack, according to Russian coroners. In the days around the funeral Kseniya was eyewitness to Putin, who had served as Sobchak’s deputy mayor from 1991-1996 and at the time was acting president of Russia. By helping Sobchak escape to Paris, Putin had saved him from arrest by hardliners in the Yeltsin administration, who feared Sobchak would succeed him as president, initiated corruption charges and sought to arrest him. 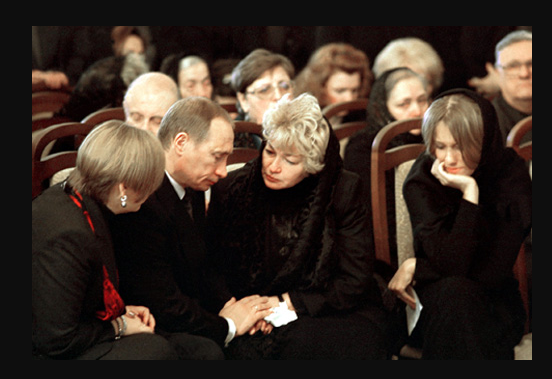 At the well-publicized funeral, Putin wept profusely. According to Kseniya in this latest interview, Putin also wept in their apartment and on the air discussing the issue and was extremely “crushed” by her father’s passing. Moreover, Putin was the only person, other than then first deputy prime minister Boris Nemtsov, who helped Sobchak and his family. She strongly rejected even the possibility that Putin would have ordered her father’s killing (https://echo.msk.ru/sounds/2159498.html). Masha Gessen recently revived the ‘Putin murdered Sobchak’ claim in a book by referencing research by a former Soviet journalist and writer, Arkadii Vaksberg. The book contains no footnotes and some dubious facts. For one, she claims that Anatolii Sobchak called Putin ‘the new Stalin” when campaigning for his first run for the presidency in 2000 [Masha Gessen, The Man Without a Face : The Unlikely Rise of Vladimir Putin (Riverhead Books, 2013), pp. 142-4 or see the excerpt from her book at www.businessinsider.com/the-mysterious-death-of-putins-mentor-2015-2]. I could not track down such a quote on the Internet, and since there are no footnotes in Gessen’s book, well…. you decide. However, I have been able to track down what Anatolii Sobchak and others who knew him said Sobchak was saying about Putin at the time, and I will provide the sources. In a 10 February 2000 interview with Anatolii Sobchak 10 days be his death, the now former St. Petersburg Mayor characterized Putin as “a person devoid of thirst for power” or “love of power” and a “strong person” with a “complicated character,” who would continue Russia’s democratization. He also described Putin as a person who values and practices loyalty (https://echo.msk.ru/blog/v_soloviev/657101-echo/). All others who knew Sobchak and/or Putin at that time well spoke about Putin and the closeness of the two Petersburg politicians’ working and personal relationships in the same positive terms. Sobchak also spoke perhaps too freely about what he knew regarding the efforts to arrest him and those who were behind it, about the need to rein in the siloviki (FSB, MVD, Prosecutor General’s Office), and about rumors that he would receive a position in the presidential administration once Putin was elected and inaugurated (https://echo.msk.ru/blog/v_soloviev/657101-echo/). Is it likely that Putin would kill his mentor, close friend, and person he was preparing to appoint to his administration, likely as its head? Unfortunately, Gessen’s work is undocumented and unreliable and she has a perverse political agenda. For his part, Vaksberg, whose views Gessen spins to portray Putin in the worst possible light, did that the version of Sobchak’s death by heart attack is not viable and that he was more likely murdered perhaps by the use of a poisonous substance that vaporizes with heat and was placed on Sobchak’s light bulb to kill him in his hotel on 20 February 2000 [http://www.svoboda.org/a/1963503.html; Gessen, The Man Without a Face : The Unlikely Rise of Vladimir Putin, pp. 143-4; and http://www.businessinsider.com/the-mysterious-death-of-putins-mentor-2015-2%5D. What Gessen doesn’t tell you about are Vaksberg’s views on Sobchak, his death, and Putin is the following: that Sobchak regarded Putin to be a “progressive” and that those who supposedly killed Sobchak did so because of his democratic influence over Putin. In February 2010 Vaksberg told Radio Svoboda: “I heard several times from Anatolii Aleksandrovich very kind words about Putin; and you can’t get away from the words of a song – as he said it I reproduce for you. He considered him a progressive, loyal person. And was probably right in his own way, because only thanks to Putin did he manage to be saved from his pursuers and in this there can be no doubt”(www.svoboda.org/a/1963503.html). By pursuers, Vaksberg is referring to people, perhaps from former President Boris Yeltsin’s inner circle who may have wanted Sobchak out of the way. Vaksberg says of them: “I think he (Sobchak) must have been in the way of those who did not want a good political influence on the country’s new leadership (Putin), and this influence undoubtedly existed because he enjoyed great authority with Putin. And people who, probably, did not want this influence in some way wanted to do this (get rid of Sobchak)” (www.svoboda.org/a/1963503.html). Thus, with the failure of the attempt to arrest Sobchak, which Putin foiled by helping him escape to Paris, Sobchak’s ‘pursuers’ replaced Plan A with Plan B a plot to kill him, according to Vaksberg. Like Gessen, Marina Sal’e, famous for having accused Putin of corruption when he was Sobchak’s first deputy mayor from 1991-1996, leaves out this key statement by Vaksberg, when writing on her Facebook page about the French version of Slate report about Gessen’s conclusions and excerpting from Vaksberg’s 2010 interview with Radio Svoboda. Sal’e introduces the excerpt from which she deletes the reason Sobchak might have been killed offered by Vaksberg in his 2010 interview with her own editorial mind-reading. Though she does not indicate that it is her editorial insert, making it appear it is Radio Svoboda’s and/or Vaksberg’s surmise, Sal’e wrote: “In fear that Putin will also kill him, Vaksberg spoke very carefully to Radio Svoboda” [В страхе, что Путин убьет и его, Ваксберг очень осторожно рассказал по «Свободе»] (www.facebook.com/Marina.Salier/posts/826231624068135). Additionally, I could find no evidence on the Internet to support Gessen’s claim that Vaksberg’s car exploded in 2007 (without him in it – he died in 2011 after a long illness]. In his 2010 Radio Svoboda interview Vaksberg says nothing and the interviewer does not ask about the supposed 2007 explosion of his car that Gessen emphasizes in her book to throw more suspicion on Putin. In sum, the version that Putin had Sobchak murdered — the first which Putin would be accused of — is dubious to say the least. It is clear from numerous pro-democratic Russians who knew Putin best in St. Petersburg that he was a man with a ‘pro-democracy’ position at the time, who had come to reject the Soviet ideology and system. My point is not that Putin is a democrat now. My point is that Putin gradually abandoned a tentative pro-democratic stance. By the time the Soviet regime fell in August 1991, Putin had decided the Soviet ideology and system were not viable if not morally unjustifiable. This is a separate issue from the Soviet state and its territorial integrity, which he and many reasonable people could accept remaining unchanged as long as a new, democratic regime gained authority over the country. Thus, when he arrived in the Kremlin to take up an office in the presidential administration and rose to the presidency, he was a typical post-Soviet Russian, who realized that the Soviet system did not work and some form of democratization and market economy were needed. However, given his Soviet and KGB background, like almost all other Soviet bureaucrats and citizens, including the most pro-democratic, he had a fuzzy understanding and therefore commitment to democracy. Thus, once he gained ultimate power in the presidency, whether by necessity to protect himself or because of some other ‘practical’ conclusion, he very gradually moved away from democratic ideals. Western policies and statements played no small role in Putin’s disenchantment with Western democracy, as they did in the disenchantment of many other Russians. This process both for Putin and for Russia as a whole was a multi-year, and for some even a two decade-long process. The dubious nature of Putin’s ‘first murder’ raises some difficult issues. It demonstrates that murders of high-ranking officials, including those close to Putin can occur in Russia. This confirms my long-held view that Putin sits atop a tinder box of competing clans based in criminal and mostly siloviki groups, which often overlap. Putin is not so much the master of these gangs, as he is their balancer and container. An assault on any one could have and perhaps still can mean his own demise. The post-Soviet system, riven by such elements, transformed Putin as did his access to great power, which always corrupts absolutely, especially over greater lengths of time. Thus, today’s Putin is different from early Putin. He will support the moderate path that is most likely to protect his interests. If democratization will do that, then democratization it will be; if soft or medium-range authoritarianism will protect his interests, soft or medium-range authoritarianism it will be. Putin will not institute democracy at great risk, no less at all costs because he supports its principles, nor will he establish a totalitarian regime unless pushed very, very hard. Yes, Putin has changed since his pro-democracy days, but he is not and will not be the ‘new Stalin.’ Those who claim this reveal far more about their lack of knowledge and/or their prejudices regarding Russia than they do about Putin.